Shaheer Sheikh figure is much favored, but do you know if the fans Shaheer Sheikh Shaheer figure is very fond of young children? You do not believe? Previous Shaheer Sheikh himself has shown how the love of a small child by uploading a photo together togetherness nephew namely Aairah. Photos togetherness together Aairah Shaheer Sheikh who was the nephew of Shaheer who uploaded it some time ago showed to intimacy and how cares Shaheer to small children. But it was not just the only Aairah Shaheer show affection Shaheer always try to be close with small children who were in the vicinity. One of them is Bilqis Khumairah Razak, who is the daughter Ayu Ting Ting. Some time ago Shaheer upload photos on his instagram account that shows his familiarity with the daughter Ayu Ting Ting Bilqis. Photos are captured while on the set of "The New Eat Bulaga Indonesia" that aired on TV staisun quiz. Shaheer was some time taking pictures while with Bilqis. 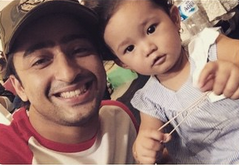 Shaheer also show a happy smile when with Bilqis. Similarly, Bilqis are not fussy and just comfortable when you are next Shaheer.Wow .. !! This is evidence Shaheer Sheikh Familiarity with Putri Ayu Ting Ting, Bilqis. Bilqis also several times shows the pose when photographed with visible Shaheer adorable intimacy between Shaheer and Bilqis Bilqis even seem happy and cheerful when Shaheer asked her to pose for the camera. Bilqis itself actually playing in the next Shaheer with less acting funny and adorable. But Shaheer Sheikh photos together Bilqis also combined with some other photos it is possible to avoid the question because it just shows together with the daughter Ayu Ting Ting. Even Shaheer also posed with one small child it is also evidence that it is indeed a handsome actor is very happy in young children.